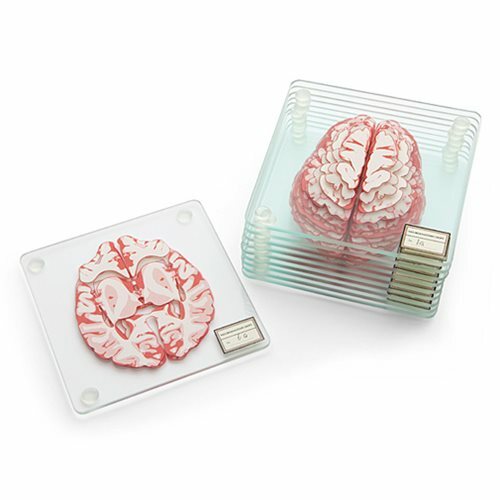 Celebrate your cerebral matter with these Brain Specimen Coasters! This pack of 10 coasters features a slice of a brain and when it is stacked together, it completes a full brain! Each coaster is made from glass and features 4 rubber feet for traction. So you never have a headache, each coaster is labeled so you can piece your brain back together. Perfect for a gift or your home, grab a set of these Brain Specimen Coasters before they're gone! Each coaster measures 4-inches. Hand wash only. Not dishwasher safe. Do not microwave. Ages 13 and up.